The Lambda 10-B is a high performance, microprocessor-controlled filter wheel for imaging applications requiring a single filter wheel. The latest release in Sutter’s optical filter changer product line, the Lambda 10-B, uses recent advances in motor technology to achieve switching times of 40msec between adjacent filters. When used with 3 position wheels, the Lambda 10-B achieves switching times of less than 33msec. It features both USB and serial port interfaces as well as keypad control. 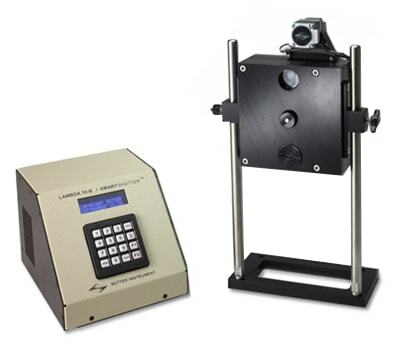 The Lambda 10-B is a low-cost alternative to the Lambda 10-2 and ideal for imaging applications requiring a single filter wheel. The Lambda 10-B can operate with switching times as brief as 40msec with our standard 25mm filter wheel as well as our newer, high-speed 32mm wheel. The user can select from seven speeds, allowing the speed to be adjusted in accordance with the load of the wheel. Except for the 4 position compact wheel, our filter wheels employ a direct drive system: a feature that prevents belt slippage or backlash. An optional shutter installation is also available. Filter selection can be made directly from the keypad or from a computer via the serial or USB port. The Lambda 10-B controller determines the shortest route to the selected filter and an acceleration/deceleration algorithm minimizes vibrations during the movement of the wheel. The current filter position is displayed on the front panel. Internal sensors monitor the position of the filter wheel to insure that the correct filter is in place. The drive uses switching mode current regulation, which is more economical than the linear supply of the Lambda 10-2. Although this is not a problem with most imaging applications, the Lambda 10-2 may be more appropriate for systems where electrophysiology is performed. Both serial and USB input ports are provided to allow complete and easy control from a remote computer. The serial port accepts RS232 level signals through a DB-9 connector. USB input is made through a standard connector and can be directly connected to a USB port. The Lambda 10-B’s USB port interface supports multiple USB devices simultaneously, allowing a user to run in tandem as many units as USB ports. The universal power supply will automatically switch to accommodate local line voltage. The basic system for the Lambda 10-B includes our popular 10 position 25mm filter wheel. A significant advantage of the Lambda 10-B controller is that it can accommodate a variety of Sutter filter wheels to suit your particular requirements. The controller will automatically detect and determine the model of wheel installed and adjust for the number of positions and filter size. Our 32mm wheel was designed to remedy the problem of vignetting that may occur with a 25mm filter format in certain microscope systems. This 32mm wheel can achieve the same 40ms switching times as achieved on our 25mm version. For applications requiring a larger aperture opening, there is a 5 position 50mm filter wheel. If additional speed is required, we offer a high-speed, 3 position 25mm wheel which is capable of achieving 31ms switching times between adjacent filters. An optional liquid light guide is available for applications requiring absolute vibration isolation, and/or spatial uniformity independent of wavelength. Shutters are available for the 25mm and 32mm wheels. ©2006 - 2018 AutoMate Scientific, Inc.